Callum Hudson-Odoi is having a night to remember for England against Montenegro this evening, as one superb moment in the second half highlights. The 18-year-old has shown no fear on his first international start for Gareth Southgate’s Three Lions on Monday night, impressing on the left with his dynamic style and even setting up Ross Barkley to score the decisive second goal of the game. 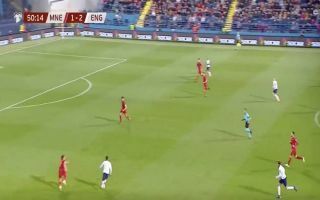 England are 3-1 up at the moment and although Hudson-Odoi has not yet found the net, he has been a consistent thorn in the side of Monetengro defenders. His brilliant weaving run and shot early in the second half perfectly encapsulated his immense talent, as he took a pinpoint aerial ball from Harry Kane in his stride before sprinting towards the box and testing the goalkeeper. Check out a clip of Hudson-Odoi in full flow below, via Twitter.